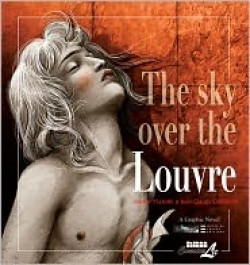 It’s a question that’s given rise to some of the greatest works of narrative art, as well as some of the crassest manifestations of popular culture, including most of today’s so-called “Reality TV” shows: “What are you willing to do to achieve your goal?” That same query lies at the heart of The Sky Over the Louvre, a tightly wound spring driving the action of this challenging and greatly entertaining original graphic novel by screenwriter Jean-Claude Carriere and artist Bernar Yslaire. Set during “The Terror,” arguably the most bloody-minded period of the French Revolution, this third volume of original graphic novels is co-published by NBM’s ComicsLit imprint and France’s famed Louvre museum. It juxtaposes the personal and political struggles of Robespierre, and especially his ill-conceived use of the guillotine to carve out his proposed new, better kind of government, with the obsessive quest of the People’s preferred artist, David, to forge a new art style that wholly embodies the ideals of the Revolution. The result is a multifaceted, unflinching contemplation of the real costs exacted by the single-minded pursuit of any goal, no matter how worthwhile, which culminates in a stunning historical moment of realization. It’s difficult to imagine two better-appointed creators to bring this complex tale to fruition. Perhaps best known for adapting The Unbearable Lightness of Being and Cyrano de Bergerac to the silver screen, Carriere’s script is immediate and richly layered with meaning. Capable of covering immense spans of emotional and narrative territory with but a well-turned phrase, it effortlessly provides the reader with all necessary background information even as it advances the action in unforeseen ways. Better still, Yslaire proves himself to be the perfect foil for Carriere’s words and ideas. His illustrations bring the cast and their era to life with an astonishing, vibrant clarity. The tension between the artist’s cartoony, almost sketchy humans and their more refined, even realistically-rendered environment echoes and embodies the script’s themes even as it grants a sense of ephemeral life to the most prosaic of scenes. It’s a synergistic verbal-visual dance of rare beauty and occurrence, which is also due in some part to the linguistic prowess of the volume’s translator, Joe Johnson. Ultimately, The Sky Over the Louvre is successful on many levels, for many reasons. But chief among them is the fact that it is an engrossing tale of historical fiction that provides readers with rich and varied rewards.